Today I am getting to hop with the Paper Pretties team. Paper Pretties has a new owner. They are now located in Wisconsin and have fast shipping. 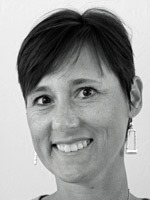 If you are Blog hopping with us are coming from Jennifer Greco’s blog. For my sample I used Surprise Sophia. I stamped her in Tuxedo Black Memento Ink on X-Press It! Blending Card and colored her with Copic Markers (Dress: B21, B24, B26, Hair: YR31, E35, E39, Skin: E0000, E00, E31, R20, Stockings: E40, E41, E43, Shoes and Bow: R24, R29, R39, W5). The stockings were textured with a paper napkin that I had laying around in Richmond at the Copic Certification and my Copic Marker 0. I cut and embossed the image with Petite Oval Nestabilities. It was layered on black cardstock and cut with a bigger Petite Oval Nestabilities. Bo Bunny Patterned paper was cut and embossed with Label 17 Nestabilities. The edges were sanded, adhered to black cardstock and cut out for a thin black layer. A 2 1/4″ x 4 1/4″ paper strip was adhered to a 4 1/4″ x 5″ piece of patterned paper. Both papers are from Bo Bunny’s ‘Tis the Season paper collection. They were stitched a 3/16″ bigger piece of Black cardstock before the layers were attached to a 4 3/4″ x 5 1/2″ Cherry Cobbler cardstock base. Royal Blue Satin Ribbon was tied into a bow with the help of Bow-Easy and topped with a black Recollection Rhinestone brad. It was adhered to the uppler left hand side of the image with Scor-Tape. Black Kaisercraft Rhinestones were adhered to the upper right hand corner of the image to tie in the rhinestone brad. The sentiment is also from Surprise Sophia. It was stamped with Tuxedo Black Memento Ink on Neenah Solar White cardstock and was cut and embossed with Petite Oval Nestabilities. 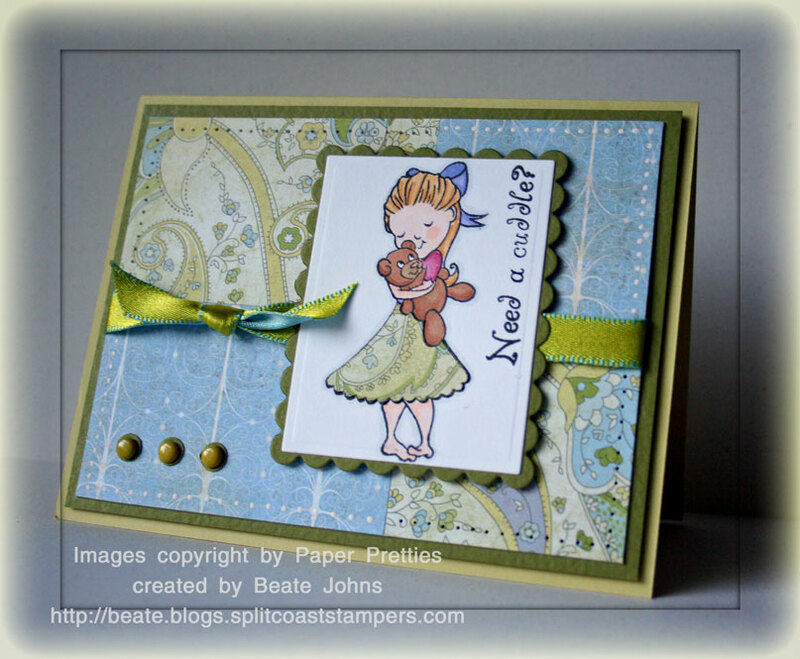 The center of the sentiment was colored with Copic Marker YG01 and Silver Rhinestone Brads were attached underneath. All day yesterday I thought it was Wednesday. So when it finally dawned on me that the sketch challenge is TODAY, I pulled out some new images and played with them and my Copic markers. They still intimidate me a bit, but I won’t get better if I don’t practise, right? 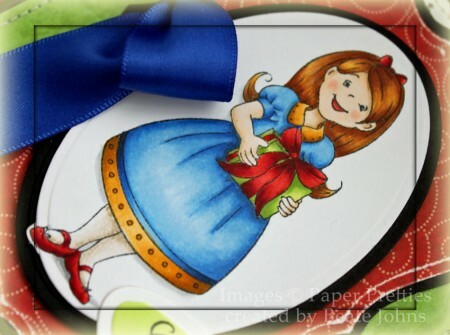 I stamped this cute little girl from Paper Pretties (remember I won it at their last Pyjama party?) in Black Palette Ink on White cardstock. Joy was so sweet to include some sheet of white cardstock with my Copics on my birthday order so I could play with them right away. I need to ask her where she got it and what brand it is. Because the Copics work great on it. 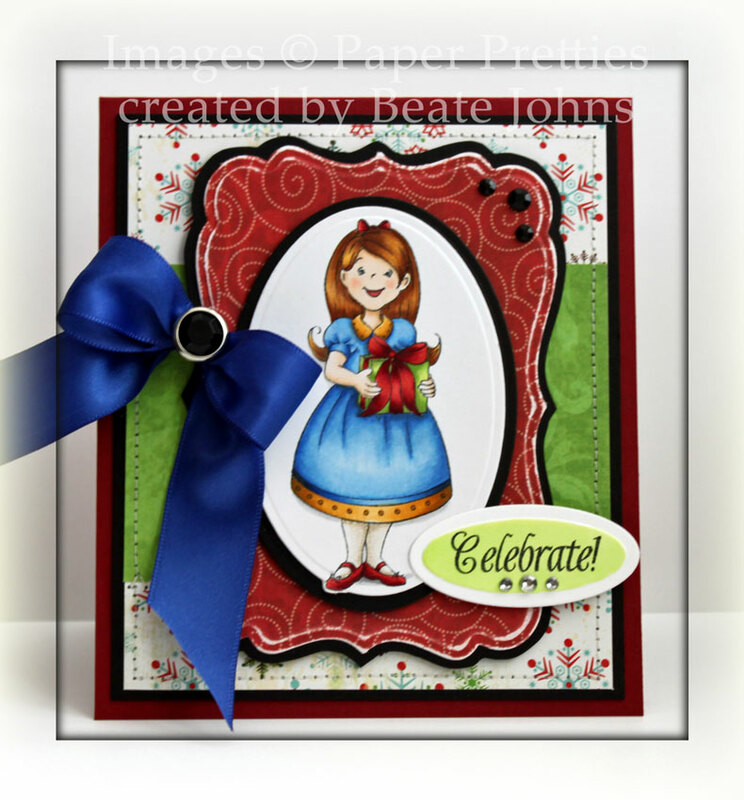 I stamped the image again on BasicGrey Lily Kate paper, cut out her skirt and set it aside. Next I colored the girl with Copics (E00 skin, E02 bear nose and girl cheek, R83 an R85 for heart, YR31 and 23 for hair, E31 and 33 for bear, BV02 for bow and outlined it with C1). The image was layered on a scalloped piece of Olive Prism Cardstock that was cut with one of the rectangle Nestabilities templates. The card base is a light green 5 1/2″ x 8 1/2″ piece of Prism cardstock folded in half. Next is a 4″ x 5 1/4″ Olive Prism cardstock piece. The BasicGrey Lily Kate paper was cut into 1 7/8″ x 3″ and 1 7/8″ x 2″ rectangles and pieced together. I added a white gel pen dotted border on the blue paper and paper pierced the paisley one. May Arts double sided ribbon was tied around it and three green brads were added on the bottom left. The brads have 1/4″ circles of the Olive cardstock underneath.